A 4,000-strong caravan of Central American migrants traveling through Mexico split up into several groups with one spending the night in a town in the coastal state of Veracruz and other migrants continuing toward the country's capital. CORDOBA, Mexico (AP) — Thousands of bone-tired Central Americans set their sights on Mexico City on Sunday after making a grueling journey through a part of Mexico that has been particularly treacherous for migrants seeking to get to the United States. An estimated 4,000 migrants are in the Gulf state of Veracruz, where hundreds of migrants have disappeared in recent years, falling prey to kidnappers looking for ransom payments. The day’s 124-mile (200-kilometer) trek was one of the longest yet, as the exhausted migrants tried to make progress walking and hitching rides toward the U.S. border still hundreds of miles away. The migrants now aim to regroup in the Mexican capital, seeking medical care and rest while they await stragglers. The caravan has found strength in numbers as it meanders north, with townspeople pouring out to offer food, water, fresh clothes and replacement footwear. In a thundering voice vote Sunday night, about 1,000 migrants at the gymnasium in Cordoba voted to try to make it to Mexico City on Monday, which would be their longest single-day journey yet since the caravan began — 178 miles (286 kilometers) by the shortest route. Earlier Sunday, the bulk of the caravan streamed into the colonial city of Cordoba, in Veracruz’s sugar belt, where they were greeted with Caribbean music and dance. Meanwhile, bleary eyed migrants who had charged ahead to Mexico City expressed gratitude for the support of their fellow travelers, saying they would not have had the strength or courage to get so far on their own. A few arrived at a large outdoor stadium in the capital, where they lounged on bleachers and watched Mexicans play soccer. City employees piled hot food onto Styrofoam plates for the migrants, some of whom had hopped freight trucks to speed their arrival to the capital. Others rested inside a church in the city of Puebla. It is unclear what part of the U.S. border the caravan will aim for eventually, or how many may splinter off on their own. Most of the migrants said they remain convinced that traveling as a large mass is their best hope for reaching the U.S. The migrants generally say they are fleeing rampant poverty, gang violence and political instability primarily in the Central American countries of Honduras, Guatemala, El Salvador and Nicaragua. Mynor Chavez, a 19-year-old from Copan, Honduras, was also determined to continue. “I have no prospects (in Honduras). I graduated as a computer technician and not even with a degree have I been able to find work,” he said of his home country. Manuel Calderon, 43, a migrant from El Salvador, lifted his shirt to show scars from two bullets he said pierced his torso in his home country. He dreams of making it back to the U.S., from which he was deported a little more than two years ago. 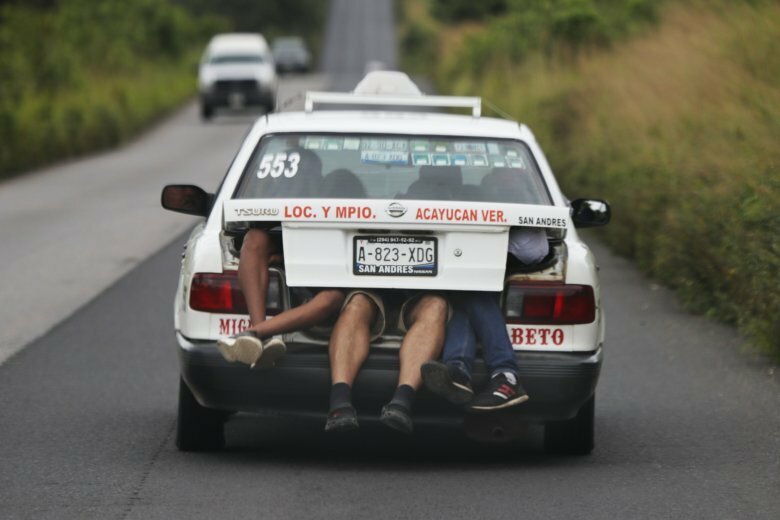 On the road, Calderon was received by ordinary Mexicans lending a hand. Catalina Munoz said she bought tortillas on credit to assemble tacos of beans, cheese and rice when she heard the migrant caravan would pass through her tiny town of 3,000 inhabitants. She gathered 15 others to help make the tacos, fill water bottles and carry fruit to weary travelers on the roadside. Mexico faces the unprecedented situation of having three migrant caravans stretched over 300 miles (500 kilometers) of highway in the states of Chiapas, Oaxaca and Veracruz. On Friday, a caravan from El Salvador waded over the Suchiate River into Mexico, bringing around 1,000 people who want to reach the U.S. border. That caravan initially tried to cross the bridge between Guatemala and Mexico, but Mexican authorities told them they would have to show passports and visas and enter in groups of 50 for processing. Another caravan, also of about 1,000 people, entered Mexico early last week. That group includes Hondurans, Salvadorans and some Guatemalans. The first, and largest, group of mainly Honduran migrants entered Mexico on Oct. 19. Mexican officials have appeared conflicted over whether to help or hinder their journey. Mexico’s Interior Ministry estimated Saturday that there are more than 5,000 migrants in total currently moving through southern Mexico via caravans or in smaller groups. The ministry says 2,793 migrants have pursued refugee status in Mexico in recent weeks and around 500 have asked for assistance to return to their countries of origin. Uncertainty awaits migrants who reach the U.S. He plans to sign an order that could lead to the large-scale detention of migrants crossing the southern border and bar anyone caught crossing illegally from claiming asylum.